Once you have poured your blood, sweat, and tears (not to mention the contents of your wallet) into building a beautiful and tranquil Koi pond, the last thing you want is to look out your window and see a wild animal making lunch out of your investment. Koi pond predator control involves making your Koi pond so unwelcoming to predators that they go somewhere else for an easy lunch. Good design is the first step. When planning your pond, consider depth. Having a deeper area in which to hide will make Koi less vulnerable to predators. Fences and nets can be used to keep your fish protected as well. While these measures will be enough to deter most common predators, there are two common predators that will be harder to dissuade. Raccoons are the most devastating pests to a Koi pond. Their innate intelligence and fishing skill make Koi a ripe target. Not only will raccoons eat your fish, they will tear up your plants and generally make a mess of your whole ecosystem. The most direct way to deal with raccoons is to remove them. Contact your local animal control for local ordinances regarding trapping and relocating wild animals. If you are lucky, a friendly animal control officer may provide the traps and take care of removal for you. Herons or other large fish-eating birds are lovely to observe in the wild, but not so lovely when they are gulping down your pet Koi. 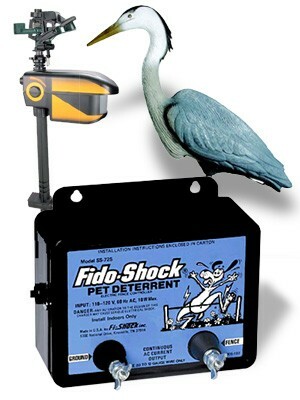 Koi pond predator control for herons involves outsmarting them. The simplest trick is to place a decoy predator in your pond. Realistic alligator heads or plastic owls will convince any hungry bird to fly past your pond, and head for a safer target. Move the decoys from time to time to insure good Koi pond predator control.